Barstool Sports presents the Starting 9 podcast, featuring Jared Carrabis and Dallas Braden - the baseball podcast everyone wants but no one else will give you. This week's episode features an episode with White Sox starter Lucas Giolito, as well as a comprehensive breakdown of the news that Vladimir Guerrero Jr will debut on Friday. Dallas and Jared also get into the news of the week, including the Brewers signing of Gio Gonzalez and the returns of Jacob deGrom and Jon Lester. The crew also debuts its new gambling segment, while also answering Twitter questions from the #groundscrew. Barstool Sports presents the Starting 9, featuring Jared Carrabis and Dallas Braden - the baseball podcast everyone wants but no one else will give you. This week's episode comes straight from Spring Training in Florida, where Dallas and Jared sat down to interview a host of players, including this week's guest - Yankees slugger Luke Voit. Voit talks living in New York, his thrilling 2019 season, growing up watching Mark McGwire, his expectations for Aaron Judge this season and much more! Dallas and Jared also get into the news of the week, including Bryce Harper's record-setting pact with the Phillies, as well as injury updates on some aces (Luis Severino, Clayton Kershaw), an All-Star catcher (Salvador Perez) and a PED suspension for a Boston knuckleballer. And, of course, we answer the Twitter questions from the #groundscrew. Barstool Sports presents the Starting 9, featuring Jared Carrabis and Dallas Braden - the baseball podcast everyone wants but no one else will give you. This week's episode features a bucket list interview with Rockies superstar and newly-extended Nolan Arenado, who sat down with Dallas and Jared during the #SpikesUpTour in Arizona at the start of Spring Training. Arenado gets into a wide variety of topics, including his time on Team USA and the World Baseball Classic, Troy Tulowitzki's impact early on during his career, the upcoming 2019 Rockies season and much more. The crew also breaks down the new Arenado record-setting contract extension, while Dallas and Jared discuss the overall experience in Arizona Spring Training. Barstool Sports presents the Starting 9 podcast, featuring Jared Carrabis and Dallas Braden. This week's episode features the sit-down chat Jared and Dallas had with the Indians rotation duo of Trevor Bauer and Mike Clevinger while experiencing Spring Training out in Arizona. In addition to that conversation, the duo also gets into the adventures of the #SpikesUpTour, as well as the Padres massive signing of Manny Machado. Barstool Sports presents the Starting 9, featuring Jared Carrabis and Dallas Braden, the baseball podcast everyone wants but no one else will give you. This week's episode features an interview with the Birdman Bat company crew out of San Francisco, who sit down with Dallas to discuss how they got into the business, the changes in the industry and their work with current professional baseball players, and much more. Jared and Dallas also get into the news of the week - Realmuto, Nola, the Twins extension, Brett Anderson, and more - while also diving into the way-too-early 2019 World Series odds from Vegas, answering questions from the #groundscrew and much more. Starting 9 Episode #77 - Rule Changes Coming? Barstool Sports presents the Starting 9, featuring Jared Carrabis and Dallas Braden - the baseball podcast everyone wants but no one else will give you. This week's episode features Dallas and Jared breaking down the proposed new rule changes or studies, including lowering the mound, the universal DH, 3-batter pitcher minimums and much more. The crew also gets into the emergence of the Giants and Padres into the Bryce Harper market, the signings of the week (Wade Miley, Curtis Granderson, Martin Perez, others) and answer Twitter questions from the #groundscrew. Oh, and updates on the first-ever Starting 9 Spring Training tour. Barstool Sports presents the Starting 9, featuring Jared Carrabis and Dallas Braden - the baseball podcast everyone wants but no one else will give you. This week's episode goes all over the place: the ongoing stalemates with Machado and Harper; the signings and trades of the week (Merrifield, Holland, relievers-a-plenty); the build-your-dream-team-for-$33 activity that has made its way across social media this week, which led to a fierce debate about who's better - Ken Griffey Jr or Mike Trout; Dallas and Jared also get into their favorite moves of the offseason so far, and we answer Twitter questions from the #groundscrew. Barstool Sports presents the Starting 9, featuring Jared Carrabis and Dallas Braden - the baseball podcast everyone wants but no one else will give you. This week's episode features the crew's reactions, analysis and future outlook on the Baseball Hall of Fame and the 2019 class - the greatness of those elected, the cases for those who missed, and of course the long-awaited rant on Harold Baines. Jared and Dallas also get into the signings and transactions of the week - Pollock to the Dodgers, the Sonny Gray trade, Markakis back to Atlanta, and others - while also dipping into the question pool to answer the #Groundscrew. Barstool Sports presents the Starting 9, featuring Jared Carrabis and Dallas Braden - the baseball podcast everyone wants but no one else will give you. This week's episode features an interview with 2017 NL Rookie of the Year and 2-time National League Champion Cody Bellinger, who talks his approach to hitting, reflects on the last two Dodgers seasons and talks about whether or not Babe Ruth called his shot. Dallas and Jared also touch on the signings and transactions of the week (Ottavino, LeMahieu, Dozier, Martin, Grandal), we get Dallas' thoughts on the Kyler Murray situation, and the crew answers Twitter questions from the #groundscrew. Barstool Sports presents the Starting 9, featuring Jared Carrabis and Dallas Braden - the baseball podcast everyone wants but no one else will give you. This week's episode is for the #Groundscrew - we spend hours answering questions of all kinds from our loyal listeners - from who would win a baseball tournament where you could bring back dead franchise legends, to childhood celebrity crushes, the best places to watch a game, to playing FMK with various housing structures, this podcast has it all. The crew also gets into the transactions of the week - David Robertson to the Phillies, Zach Britton back to the Yanks, Kelvin Herrera to the Southside of Chicago, and we sneak in the late-night signing of Yasmani Grandal to the Brew Crew. Description: Barstool Sports presents the Starting 9, featuring Jared Carrabis and Dallas Braden - the baseball podcast everyone wants but no one else will give you. This week's episode brings the crew back for the first time in a few weeks, and there's a lot to catch up on: this week's deals (Nelson Cruz, Yusei Kikuchi, Troy Tulowitzki), deals over the past few weeks (Harvey, Profar, Puig/Wood, Lynn, Murphy, Brantley, Miller and more), updates on our thoughts on Manny Machado and Bryce Harper, an update on how notable names are polling in the upcoming Hall of Fame election cycle and, of course, questions from the #groundscrew. Barstool Sports presents the Starting 9, featuring Jared Carrabis and Dallas Braden - the baseball podcast everyone wants but no one else will give you. This week's episode features an interview with 2018 AL Manager of the Year Bob Melvin, who sat down with the crew in Las Vegas during the Winter Meetings to discuss a variety of topics - the 2018 Athletics, shifting, his experiences in the game and much more. Jared and Dallas also break down their experience on the ground at the 2018 Winter Meetings, while also touching on a variety of the transactions that occurred there, including Andrew McCutchen, JA Happ, Charlie Morton and more! Barstool Sports presents the Starting 9, featuring Jared Carrabis and Dallas Braden - the baseball podcast everyone wants but no one else will give you. This week's episode features a comprehensive recap of all the major action around MLB's Hot Stove over the last week: Paul Goldschmidt's trade to the Cardinals, the Nationals signing Patrick Corbin, the Mets trading for Edwin Diaz and Robinson Cano, and the Phillies acquiring Jean Segura. The crew also debates the merits of the ‘ban the shift' discussion circling around baseball, while also touching on the anniversaries of Miguel Cabrera's trade to the Tigers, and Albert Pujols signing with the Angels. Barstool Sports presents the Starting 9, featuring Jared Carrabis and Dallas Braden - the baseball podcast everyone wants but no one else will give you. This week's episode features an interview with 3-time All-Star, former 20-game winner and Angels great Jered Weaver, who talks Boras, Scioscia, hitting Kyle Seager, the pitching trends of the modern game and much more. Dallas and Jared also get into the Braves signings of Josh Donaldson and Brian McCann, the swirling rumors around Robinson Cano, Paul Goldschmidt and Madison Bumgarner, in addition to the spate of minor transactions that occurred over the last week (CJ Cron, Chris Archer surgery, Matt Moore). The crew also answers Twitter questions from the #groundscrew. Barstool Sports presents the Starting 9, featuring Jared Carrabis and Dallas Braden - the baseball podcast everyone wants but no one else will give you. This week's episode features an interview with Billy Corben, who directed the documentary Screwball, which looks at MLB's steroid era and the Alex Rodriguez scandal. The crew also breaks down the James Paxton trade to the Yankees and Adrian Beltre's retirement and place among the greatest ever at his position, the results of the major BBWAA Awards (MVP, Cy Young, Rookie of the Year, Manager of the Year), and give their initial thoughts on this year's debut names on the Hall of Fame ballot, including Mariano Rivera, Roy Halladay, Todd Helton and Andy Pettitte. Dallas and Jared also answer questions from the #groundscrew. Barstool Sports presents the Starting 9, featuring Jared Carrabis and Dallas Braden - the baseball podcast everyone wants but no one else will give you. This week's episode is a very special one, featuring an interview with the Ironman himself, the Hall of Famer Cal Ripken Jr, who walks through his childhood in the game, his influences, his thoughts on the modern game and much more. This podcast also represents the much-awaited Awards podcast, where the crew breaks down each of the awards - MVP, Cy Young, Rookie of the Year, Manager of the Year - in both leagues. Mookie or Trout for AL MVP? Cora, Melvin or Cash for AL Manager? Soto or Acuna for NL ROY? Dallas and Jared break it all down. The crew also hits on the news of the week, including Bryce Harper's $300M offer from the Nationals, Lance McCullers Tommy John surgery, CC Sabathia returning to the Yankees, Dave Roberts and the Dodgers agreeing to an extension and the prospect of the Mariners blowing it all up. Barstool Sports presents the Starting 9, featuring Jared Carrabis and Dallas Braden - the baseball podcast everyone wants but no one else will give you. This week's episode dives in head first to the offseason action, from the big names - Harper, Machado, Kershaw - to more than a dozen transactions that have already happened (or agreed to) this offseason, including Brett Gardner, Trevor Rosenthal, David Price opting in, Fernando Rodney, the Mets hiring Brodie Van Wagenen as GM, and much more. The crew also answers questions from the #groundscrew. Oh and it recaps the World Series and Jared's Duck Boat adventures. Barstool Sports presents the Starting 9, featuring Jared Carrabis and Dallas Braden - the baseball podcast everyone wants but no one else will give you. This week's episode features the reason we are all here: the preview of the World Series. Red Sox. Dodgers. We ask the most important questions going into the series and Dallas and Jared break them down. We also say a few final words on the 2018 Milwaukee Brewers, touch on the news from around baseball (Altuve surgery, hirings of Ausmus and Bell) and much more! Barstool Sports presents the Starting 9 featuring Jared Carrabis and Dallas Braden - the baseball podcast everyone wants but no one else will give you. This week's episode features the fresh, morning-after reactions from Jared as the Red Sox advance to the World Series, a breakdown of the ALCS from Jared and Dallas, a preview of Friday's NLCS Game 6, and a review of the ‘postseason narratives' as it relates to David Price and Clayton Kershaw. The guys also touch on the headline topics of the week, including Machado/Aguilar, the Mookie Betts/fan interference call, the Astros/Red Sox ‘cheating' story, as well as some news from around MLB: Gregorius surgery, Chapman surgery, Marlins HR statue and an update on Vlad Guerrero Jr in the Arizona Fall League. Barstool Sports presents the Starting 9, featuring Jared Carrabis and Dallas Braden - the baseball podcast everyone wants but no one else will give you. This week's episode features a ton of hot baseball content packed into 90 minutes: an interview with the soon-to-be NL MVP (Christian Yelich); an interview with the newest member of the Indians stud rotation (Shane Bieber); and Dallas and Jared preview all of the Division Series matchups: Yankees-Red Sox, Rockies-Brewers, Braves-Dodgers and Indians-Astros, in the way only that duo can. Barstool Sports presents the Starting 9, featuring Jared Carrabis and Dallas Braden, the baseball podcast everyone wants but no one else will give you. This week's episode features a truly epic guest - World Series winner, one of the greatest DH's of all time, one of the most clutch players in baseball history - Big Papi, David Ortiz. Ortiz touches on this year's Red Sox, the home run mashing going on out in Oakland with Khris Davis and others, Bo Jackson, and the pitching in the modern game - including some thoughts on Blake Snell of the Rays - and much more. The guys also get into a wide variety of news, including Shohei Ohtani's impending Tommy John, John Gibbons and the Blue Jays parting ways, the developing situations with Roberto Osuna and Addison Russell, the injuries to Didi Gregorius and Dansby Swanson, and more. The crew dives into the wild postseason situation as we head into the final weekend, while also paying final respects to a trio of greats leaving the game - David Wright, Victor Martinez and Ken “Hawk” Harrelson. The crew also answers questions from the #groundscrew. Barstool Sports presents the Starting 9, featuring Jared Carrabis and Dallas Braden - the baseball podcast everyone wants but no one else will give you. This week's episode features an interview with Atlanta Braves ace Mike Foltynewicz, who talks about the Braves surge to the top of the NL East, his electric season, the rise of Ronald Acuna, fatherhood and much more. Jared and Dallas also get into: Trevor Story's injury news, Aaron Judge's return to the lineup, Marlins Man ‘making up with' the Marlins, Blake Snell reaching 20 wins, the Yankees activating Aroldis Chapman and the terrible NL MVP take by Barstool's own White Sox Dave. In addition, the crew continues the HUT SEAT segment, this time touching on every single National League team with topics like, “Is Ronald Acuna already one of the 5 best players in the NL?”, “Is Aaron Nola's 2018 the best Phillies pitching season since Steve Carlton?”, “was Jesus Aguilar's 1st half a mirage?” and many, many more takes. Jared and Dallas also answer questions from the #groundscrew. Barstool Sports presents the Starting 9, featuring Jared Carrabis and Dallas Braden - the baseball podcast everyone wants but no one else will give you. This week's episode features a fascinating and sprawling interview with Detroit Tigers teammates Nicholas Castellanos and Shane Greene, who dive into their careers, their interaction with social media, their podcast, fellow players getting paid market value and much more! Dallas and Jared also get into a wide variety of topics, including the Josh Donaldson trade, Ryan Howard's retirement, the Mariners clubhouse ‘fight', Christian Yelich's rise to superstardom and we revisit the National League Rookie of the Year race between Juan Soto and Ronald Acuna. The crew also enjoys some listener-submitted Homer Minutes, and answer Twitter questions from the #groundscrew. Barstool Sports presents the Starting 9, featuring Jared Carrabis and Dallas Braden - the baseball podcast everyone wants but no one else will give you. This week's episode features an interview with Diamondbacks relief ace Archie Bradley, who discusses the D-Backs season, his desire to return to the rotation, why Paul Goldschmidt doesn't get the national love he deserves, and much more! Dallas and Jared also get into the Cardinals extending Mike Shildt, the injuries to Sean Manaea and Brett Anderson, the Jose Bautista trade, we run through a number of interesting ‘will they or won't they' scenarios for statistical markers (good and bad), discuss the red-hot Tampa Bay Rays, listener-submitted Homer Minutes, a visit for a special Philly-area Barstool personality, Twitter questions from the #groundscrew and much more! Barstool Sports presents the Starting 9 featuring Jared Carrabis and Dallas Braden, the baseball podcast everyone wants but no one else will give you. This week's episode features an interview with 2004 AL Rookie of the Year Bobby Crosby, who discusses his rise and fall in the Majors, what he's been up to since and his lifelong relationship with the Oakland Athletics. Dallas and Jared also get into the Nationals sell-off and the Cubs and Cardinals acquisitions of Daniel Murphy and Matt Adams, respectively; some notable injuries to star players - Aroldis Chapman, Yu Darvish, Buster Posey; the red-hot runs from the Cardinals and Rockies; the continuation of listener-submitted Homer Minutes, and of course Twitter questions from the #groundscrew. Barstool Sports presents the Starting 9 featuring Jared Carrabis and Dallas Braden - the baseball podcast everyone wants but no one else will give you. This week's episode features an interview with Colorado Rockies left-hander Kyle Freeland, in the midst of a breakout campaign, who stopped by to talk the 2018 Rockies season, his development, growing up a Rockies fan in Denver, and more. Dallas and Jared also get into Ronald Acuna's blistering run, Edwin Diaz's race to catch Francisco Rodriguez, the return of Robinson Cano from suspension, Trevor Bauer's injury and more. The crew also reacts to a new batch of listener-submitted Homer Minutes and answers Twitter questions from the #groundscrew. Barstool Sports presents the Starting 9, featuring Dallas Braden and Jared Carrabis - the baseball podcast everyone wants but no one else will give you. This week's episode features an interview with the voice of the Dodgers - Joe Davis - who discusses the current state of the Dodgers, Manny Machado's free agency, Corey Seager's injury issues and much more. Jared and Dallas also touch on some of the biggest stories of the week, including: Mike Scioscia's future, Rick Ankiel's potential 2019 comeback, Bryce Harper's post-Derby surge, the muddled NL MVP conversation, Twitter questions from the #groundscrew, we turn over the Homer Minute to multiple listeners who vent about their favorite teams for 60 seconds - and much more! Barstool Sports presents the Starting 9 podcast, featuring Jared Carrabis and Dallas Braden - the baseball podcast everyone wants but no one else will give you. This week's episode features an interview with 1986 World Series winner and baseball legend Mookie Wilson, who reminisces about 1986, what could have been with that team's core, the modern game and much more! Dallas and Jared also break down about a dozen trades that happened leading up to the deadline, the Athletics tying the Mariners for the 2nd AL Wild Card spot, the Nationals mess (Kintzler, Kelley, Harper) and Chris Sale heading to the DL. The crew also answers Twitter questions from the #Groundscrew, while also providing 60 seconds of ranting on their favorite teams in America's favorite new segment, The Homer Minute. Barstool Sports presents the Starting 9 podcast, featuring Jared Carrabis and Dallas Braden - the baseball podcast everyone wants but no one else will give you. This week's episode is a very special one, recorded on-location in Washington DC following the 2018 MLB All-Star Game. The crew - together in the same place for the podcast for the first time ever - breaks down the memorable moments from the Midsummer Classic, the lasting impressions of Bryce Harper's epic showing in the Home Run Derby, the Manny Machado trade rumor drama, Josh Hader's posts on Twitter, and of course answers questions from the #groundscrew. Dallas and Jared also share some of their off-the-field stories from their time in DC. Barstool Sports presents the Starting 9 podcast, featuring Jared Carrabis and Dallas Braden - the baseball podcast everyone wants but no one else will give you. The 50th episode features an interview with freshly-minted All-Star Jed Lowrie of the Oakland Athletics, who talks about making the Midsummer Classic, the Athletics surprising season and much more. Jared and Dallas also get into a variety of current topics, including: Ken Giles demotion, Vladimir Guerrero Jr's impending promotion, the Phillies place in the NL East, the Dexter Fowler/Cardinals situation, Manny Machado trade rumors, the Final Vote results and more. The crew also digs into Twitter questions from the #groundscrew and this week's edition of the Homer Minute. Barstool Sports presents the Starting 9 podcast, featuring Jared Carrabis and Dallas Braden - the baseball podcast everyone wants but no one else will give you. This week's episode features an interview with former Red Sox and Yankees legend Johnny Damon, who talks about his memories of those years, what he's been up to lately, and his impressions of the game today. Jared and Dallas also hand out their 1st Half Awards in both leagues - MVP, Cy Young, Rookie of the Year, along with unique awards like the Saugus Rocket Award and the 209 Mayor Award. The crew also debuts the Homer Minute - a quick, 60-second assessment of the ‘home teams' of the three podcast participants. Barstool Sports presents the Starting 9 podcast, featuring Jared Carrabis and Dallas Braden - the baseball podcast everyone wants but no one else will give you. This week's episode features an interview with current Colorado Rockies shortstop and potential 2018 All Star Trevor Story, who talks about his amazing initial taste of the big leagues, his 2018 season and what it's like to play in Denver. Jared and Dallas also get into the big storylines of the week, including but not limited to Sergio Romo/Michael Taylor standoff, Josh Donaldson's setback and Archie Bradley's poop-in-pants story. The crew also looks at potential weaknesses that have emerged among notable contenders - Nationals offense, Cardinals rotation to name two - and assesses whether it's reason for real concern or just a blip in a long season. Dallas and Jared also answer the Twitter questions from the #groundscrew. Barstool Sports presents the Starting 9 podcast, featuring Jared Carrabis and Dallas Braden - the baseball podcast everyone wants but no one else will give you. This week's episode features an electric interview with our own Pat McAfee, who talks about his cross-over independent league baseball event and his growing knowledge of the game. Dallas and Jared also get into the biggest stories of the week, including the Astros red-hot play, the rise of Juan Soto, the Nationals acquisition of Kelvin Herrera and Hunter Strickland's self-inflicted injury. The crew also plays “buy or sell” on 8 possible realities or storylines from around baseball, including but not limited to: Mike Trout winning the AL MVP; the Braves being the best team in the NL East; and the Mets trading at least one of Jacob deGrom or Noah Syndergaard - and many more. The guys also answer questions from the #groundscrew. Barstool Sports presents the Starting 9 podcast, featuring Jared Carrabis and Dallas Braden - the baseball podcast everyone wants but no one else will give you. This week's episode features an interview with Barstool's own Dan Katz/Big Cat, who discusses Jake Arrieta's return to Wrigley Field, and his importance to the Cubs during his time there. Dallas and Jared also get into a wide variety of topics, including: Madison Bumgarner's return, Cody Bellinger's potential demotion, Tim Lincecum's release, Vladimir Guerrero Jr's possible promotion to Triple-A (and the Majors? ), Jake Arrieta's importance to both the Phillies and Cubs, the Yankees vs ESPN scheduling showdown - and much more, including Twitter questions from the #groundscrew. Barstool Sports presents the Starting 9 podcast featuring Jared Carrabis and Dallas Braden - the baseball podcast everyone wants but no one else will give you. This week's episode features an interview with White Sox rookie Matt Skole, fresh off his impressive MLB debut, who talks about his journey to the big leagues and much more! Jared and Dallas also reflect on Justin Verlander's current and past greatness and where he fits within his era; the impressive play of both the Milwaukee Brewers and the Seattle Mariners; the designation of Hanley Ramirez - and, of course, Twitter questions from the #groundscrew. Barstool Sports presents the Starting 9 featuring Jared Carrabis and Dallas Braden - the baseball podcast everyone wants but no one else will give you. This week's episode features former AL MVP and World Series champion Dustin Pedroia of the Boston Red Sox, who discusses his comeback from injury, tells stories of David Ortiz and Manny Ramirez and much more. Jared and Dallas also touch on a wide range of topics around MLB, including Mike Trout, Gleyber Torres' impressive start to his career, the Blue Jays keeping Vladimir Guerrero Jr down, the D-Backs recent slide, the Indians mediocre first two months, the Rays use of Sergio Romo and , as always, the crew answers Twitter questions from the #groundscrew. Barstool Sports presents the Starting 9, featuring Jared Carrabis and Dallas Braden - the baseball podcast everyone wants but no one else will give you. This week's episode features an interview with former MLB great, author current broadcaster Keith Hernandez, who talks about his time in the game, what needs changing and why it's still a beautiful sport, the Matt Harvey situation and much more. Dallas and Jared also discuss the Robinson Cano suspension, Joey Votto's comments about the Reds, and the crew runs down the 9 teams with the worst odds to make the postseason and gives (at least) one reason for fans of each team to be hopeful for the future. Dallas and Jared also answer Twitter questions from the #groundscrew. Barstool Sports presents The Starting 9 podcast, featuring Jared Carrabis and Dallas Braden - the baseball podcast everyone wants but no one else will give you. This week's episode features an interview/therapy session with Barstool's own Kevin Clancy/KFC, who talks Mets, the trade of Matt Harvey, Michael Conforto's struggles and more. Jared and Dallas also touch on the biggest stories of the week, including Albert Pujols reaching 3,000 hits, Clayton Kershaw to the DL, the Yankees recent dominance and James Paxton's remarkable recent starts. The crew also answers Twitter questions from the #groundscrew, as well as a moment to remember Wednesday's anniversary of Dallas' perfect game from 2010. Barstool Sports presents the Starting 9 podcast, featuring Jared Carrabis and Dallas Braden - the baseball podcast everyone wants but no one else will give you. This week's episode features legendary baseball scribe Jayson Stark, who returns to Starting 9 to talk about his new gigs, impressions of the 2018 season, the Dodgers, Bauer/McCullers/spin rate/foreign substances, Mark McGwire and much more. Dallas and Jared also take the opportunity to assess the notable storylines and surprises for EACH and EVERY division around MLB now that we are one month into the season. The crew also goes back in time to change one moment or call in MLB history as part of the Twitter questions from the #groundscrew. Barstool Sports presents the Starting 9 podcast, featuring Jared Carrabis and Dallas Braden - the baseball podcast everyone wants but no one else will give you. This week's episode features a very special guest - owner of the most recent no-hitter in MLB history - Oakland Athletics lefty Sean Manaea, who recaps his epic evening and his journey to this point. Dallas and Jared also recap Jared's trip to California, discuss Mike Trout and Shohei Ohtani of the Angels, go rapid-fire on a wide-range of MLB topics and trends, including but not limited to - Ronald Acuna's call-up, Albert Pujols' age issues, the surging Phillies and Rhys Hoskins, MLB's strikeout problem, the Brew Crew and much more. The group also answers Twitter questions from the #groundscrew. Barstool Sports presents the Starting 9 podcast, featuring Jared Carrabis and Dallas Braden - the baseball podcast everyone wants and no one else will give you. This week's episode features an interview with current New York Yankee Tyler Austin, who talks about his MLB experience and baseball upbringing and fandom. Dallas and Jared also discuss the Blue Jays and Roberto Osuna, Shohei Ohtani and the fast-starters in the NL (Diamondbacks, Mets, Pirates). The crew also keeps the Miami - er, British Virgin Isles - Marlins honest, looks ahead to the weekend with the start of the D-Backs/Dodgers series, Ohtani lining up against the Royals for his next start, and the red-hot Mets squaring off against the Brewers, while also diving into Twitter questions submitted by the #groundscrew. Barstool Sports presents the Starting 9 podcast featuring Jared Carrabis and Dallas Braden - the baseball podcast everyone wants but no one else will give you. This episode features an interview with former MLB player and current analyst for SportsNet LA, Jerry Hairston Jr, who touches on Clayton Kershaw, Kenley Jansen's early struggles, Bryce Harper, Shohei Ohtani and more. In addition to recapping Braden's experience as part of Oakland's 50th anniversary team, Dallas and Jared give their initial reactions to Ohtani, their reaction to Giancarlo Stanton being booed at his Yankee Stadium debut and the Cardinals signing of Greg Holland. The group also goes through each division and gives one player, trend or development that stands out to them after the first week of MLB action. And, of course, questions from the #groundscrew. Barstool Sports presents The Starting 9 featuring Jared Carrabis and Dallas Braden - the baseball podcast everyone wants but no one else will give you. This week's episode features an interview with MLB Network Radio's Jim Duquette, as well as the final installment of the crew's division preview series, this time focusing on the NL Central and AL East teams. In addition, Dallas and Jared discuss Jose Altuve's extension with Houston, Alex Cobb joining the Orioles, Justin Turner's injury, Shohei Ohtani, Ronald Acuna and more, including voicemails from the #groundscrew." “Barstool Sports presents the Starting 9 featuring Jared Carrabis and Dallas Braden, the baseball podcast everyone wants but no one else will give you. This week's episode features a discussion of all the angles behind Jake Arrieta joining the Phillies, a look at Mike Moustakas returning to Kansas City, and a continuation of the “Division Preview” series, this time focusing on the NL East and the NL West teams. We also are joined by former MLB All-Star pitcher Bob Tewksbury, now the mental performance coach for the San Francisco Giants, for an interview. And, as always, Jared and Dallas answer some Twitter questions from the #groundscrew." “Barstool Sports presents Starting 9, featuring Jared Carrabis and Dallas - the baseball podcast everyone wants but no one else will give you. This week's episode features Mark Feinsand, Executive reporter for MLB.com, who joins Dallas and Jared for a trip across MLB, hitting on many different teams and storylines. The Starting 9 crew also begins its Division Preview series, starting with the AL West and AL Central, hitting every team in each of those divisions, touching on storylines or players that we are looking forward to watching in 2018. Dallas and Jared also answer Twitter questions from the #groundscrew." Barstool Sports presents Starting 9, featuring Jared Carrabis and Dallas - the baseball podcast everyone wants but no one else will give you. This week's episode features guest Jenny Cavnar of ROOT Sports, who talks Rockies offseason, 2018 outlook, her long history with Dallas and much more. Jared and Dallas also discuss the Rangers' signing of Tim Lincecum, try to find homes for notable remaining free agents like Jake Arrieta, Mike Moustakas, Alex Cobb and more, while also answering questions from the #groundscrew. Barstool Sports presents the Starting 9, featuring Jared Carrabis and Dallas Braden. The baseball podcast everyone wants but no one else will give you. This week's episode features Cliff Floyd of MLB Network, who dominated the interview game, talking 2018 season, Rickey Henderson stories, his old team the Marlins and much more! Jared and Dallas also break down the rash of ACTUAL signings that occurred since the last podcast: JD Martinez to the Red Sox and Eric Hosmer to the Padres, along with the Yankees/Rays/D-Backs three-way trade. The group also answers Twitter questions from the #groundscrew. Barstool Sports presents the Starting 9, featuring Jared Carrabis and Dallas Braden. The baseball podcast everyone wants but no one else will give you. This week's episode features Jessica Kleinschmidt of Cut4/MLB.com, who talks her career, her perspective on baseball and where she was for a game that would change her life (or not) - Dallas Braden's perfect game. Jared and Dallas also get into the Cubs signing of Yu Darvish, the return of the Melky Cabrera fake website PED scandal, we give our own perspectives on the up-and-coming Rough-N-Rowdy 2, and answer questions from the #groundscrew. Barstool Sports presents the Starting 9, featuring Jared Carrabis and Dallas Braden. The baseball podcast everyone wants but no one else will give you. This week's episode features special guest and friend of Barstool - former MLB veteran Paul Lo Duca, who absolutely does not stick to baseball during this interview. Dallas and Jared also discuss J.D. Martinez reportedly being 'fed up' with the Red Sox, the news that Ervin Santana will be out into May, Barstool's own KFC joins to "talk Todd Frazier" (actually: rant about the Mets), Tim Lincecum's showcase next week, the ongoing war of words between MLB and MLBPA, the Giants retiring Barry Bonds' number, Jeter firing the man inside of Billy the Marlin - and more! Barstool Sports presents the Starting 9, featuring Jared Carrabis and Dallas Braden. The baseball podcast everyone wants but no one else will give you. This week's episode features guest Tim Brown of Yahoo Sports, who joins to remember the late Kevin Towers. He also discusses giving up his Hall of Fame ballot, the legend of Vladimir Guerrero, the cold free agency market this offseason and more. Dallas and Jared break down the Yelich/Cain acquisitions for the Brewers, the announcement that Cleveland will move on from Chief Wahoo following the 2018 season, answer Twitter questions from listeners and more! Barstool Sports presents the Starting 9, featuring Jared Carrabis and Dallas Braden. The baseball podcast everyone wants but no one else will give you. In this episode, we break down all the angles from Wednesday's 2018 Baseball Hall of Fame Class announcement - the 4 who will be inducted, the man who just missed, and what we think will happen in the 2019 cycle. The crew also talks to Cardinals breakout star Tommy Pham, who gives his reactions to the Hall of Fame, reflections on his 2017, the outstanding, new-look Cardinals outfield - and more. Jared and Dallas also answer Twitter questions from the grounds crew, along with quick thoughts on A-Rod joining Sunday Night Baseball and the Padres social media getting "hacked". Barstool Sports presents the Starting 9, featuring Jared Carrabis and Dallas Braden. The baseball podcast everyone wants but no one else will give you. This week's episode features guest catcher Jonathan Lucroy, who talks experiencing free agency for the first time, hitting in Coors Field and his work to combat performance-enhancing drug use. We also the Andrew McCutchen trade, the comments by Christian Yelich's agent, we form our all-time Home Run Derby team, we welcome Barstool's own KFC to chat a little Mets - and more! Barstool Sports presents the Starting 9, featuring Jared Carrabis and Dallas Braden. The baseball podcast everyone wants but no one else will give you. This week's episode features two separate interviews: one with 2-time World Series champion David Eckstein, and the other with former MLB player, friend of Dallas Braden and current radio voice of the Phillies, Kevin Frandsen. Dallas and Jared also get into the Gerrit Cole traded-or-not-traded saga, Starlin Castro's request to be traded out of Miami, Dave Cameron leaving Fangraphs to join the Padres and we answer questions from the listeners! Barstool Sports presents the Starting 9, featuring Jared Carrabis and Dallas Braden. The baseball podcast everyone wants but no one else will give you. This week's episode features guest Tom Verducci of SI, who talks the state of baseball, Hall of Fame and hot stove. Dallas and Jared also get into the multiple suitors for Eric Hosmer, J.D. Martinez's reported offer from Boston, Wade Davis joining the Rockies, we check in with This Week in Derek Jeter, answer questions from listeners - and more! To celebrate the holidays, the Starting 9 crew presents stories from 12 selected interviews from our 2017 season. Listen to some of the best answers and funniest moments with Jared Carrabis, Dallas Braden and the guests. Guests including new Yankees Manager Aaron Boone, World Series Champion's Lance McCullers and Alex Bregman, Miami Marlins outfielder Christian Yelich, Chris "Mad Dog" Russo, 3x World Series Champ Curt Schilling, and more! Barstool Sports presents the Starting 9, featuring Jared Carrabis and Dallas Braden. The baseball podcast everyone wants but no one else will give you. This week's episode features special guest Jayson Stark, who discusses his approach to the Hall of Fame ballot, the names he's going with this year, and his experience as part of the special committee that elected Jack Morris and Alan Trammel. Jared and Dallas also get into the Giants acquiring Evan Longoria, the Orioles losing Zach Britton and the continuation of the Manny Machado saga, the potential for a Tim Lincecum comeback, questions from the Grounds Crew and more! Barstool Sports presents the Starting 9, featuring Jared Carrabis and Dallas Braden. The baseball podcast everyone wants but no one else will give you. This week's episode features an interview with Red Sox outfielder Andrew Benintendi, along with insight on Giancarlo Stanton to the Yankees, Marcell Ozuna to the Cardinals, Shohei Ohtani's damaged elbow, Manny Machado rumors, the relief pitcher market explosion and, of course, questions from the listeners. We also check in on Jared'd well-being. Barstool Sports presents the Starting 9, featuring Jared Carrabis and Dallas Braden. The baseball podcast everyone wants but no one else will give you. Emergency mini-podcast! Jared and Dallas give you their reactions to the news that Shohei Ohtani has chosen the Los Angeles Angels. Barstool Sports presents the Starting 9, featuring Jared Carrabis and Dallas Braden. The baseball podcast everyone wants but no one else will give you. Our guest this week is brand new Boston Red Sox manager Alex Cora, who discusses the challenges and excitement ahead in Boston, the championship run in Houston, and more. Dallas and Jared touch on Rafael Palmeiro's hopes for a comeback, Shohei Ohtani's ultimate home, Aaron Boone being introduced as Yankees manager, listener Twitter questions and more. Barstool Sports presents the Starting 9, featuring Jared Carrabis and Dallas Braden. The baseball podcast everyone wants but no one else will give you. This episode includes special guest Jeff Passan of Yahoo Sports, who discusses his decision to give up his Hall of Fame ballot and the Hall of Fame in general. Nick Goody of the Cleveland Indians also joins the podcast to discuss the Tribe and his favorite Terry Francona story. Dallas and Jared also go in on the Marlins 'ultimatum' to Giancarlo Stanton, the latest on Shohei Ohtani, the newest rumors (Jose Abreu to Boston?) and more! Barstool Sports presents the Starting 9, featuring Jared Carrabis and Dallas Braden. The baseball podcast everyone wants but no one else will give you. This episode features special guest Curt Schilling, who joins to talk the 2018 Hall of Fame ballot, PED users and his perspective on the Hall in general. Dallas and Jared also break down the severe punishments MLB hit the Braves with on Tuesday, the 20-second pitch clock, Giancarlo Stanton to the Giants (and many other rumors), Twitter questions from the fans and more! Barstool Sports presents the Starting 9, featuring Jared Carrabis and Dallas Braden. The baseball podcast everyone wants but no one else will give you. This week the guys interview star closer from the Milwaukee Brewers Corey Knebel to talk about his stellar 2017 season, his favorite baseball video game, brewing his own beer, and a secret tattoo. Jared and Dallas also talk about the MVP, Cy Young, and Manager of the Year Award winners for both the American and National Leagues, and update the grounds crew on all the off season hot stove topics. This week the guys interview star closer from the Milwaukee Brewers Corey Knebel to talk about his stellar 2017 season, his favorite baseball video game, brewing his own beer, and a secret tattoo. Jared and Dallas also talk about the MVP, Cy Young, and Manager of the Year Award winners for both the American and National Leagues, and update the grounds crew on all the off season hot stove topics. Barstool Sports presents the Starting 9, featuring Jared Carrabis and Dallas Braden. The baseball podcast everyone wants but no one else will give you. Featuring guest and newly-minuted World Series champion Alex Bregman of the Astros, who talks his experiences in the World Series, some misadventures in the Twitter DMs and more. Jared and Dallas also talk Roy Halladay, awards finalists, Boras wanting $200M for JD Martinez, Tanaka and Cueto opting-in and more! Linkedin - Go to Linkedin.com/NINE and get a $50 credit toward your first job post. Barstool Sports presents the Starting 9, featuring Jared Carrabis and Dallas Braden. The baseball podcast everyone wants but no one else will give you. Features special guest "Mad Dog" Chris Russo, who helps recap the storylines coming out of Game 7 and the Astros championship. Dallas and Jared also touch on the Justin Upton news, as well as the best and brightest stories we'll remember from the 2017 season. Barstool Sports presents the Starting 9, featuring Jared Carrabis and Dallas Braden. The baseball podcast everyone wants but no one else will give you. Includes special guest and current World Series participant Lance McCullers of the Houston Astros. The duo reacts to the absolutely wild Game 2, including Rich Hill being pulled, Kenley Jansen doing something he hasn't done all season, Charlie Culberson's HR reaction and more. Other topics include: Giancarlo Stanton's appearance on Jimmy Kimmel, Clayton Kershaw's postseason legacy and more! Barstool Sports presents the Starting 9, featuring Jared Carrabis and Dallas Braden. The baseball podcast everyone wants but no one else will give you. Includes guest Casey Stern of MLB Network Radio and MLB on TBS, who has had a first-hand look at the 2017 postseason as it plays out. Jared and Dallas react to Wednesday's Game 5 between the Yankees and Astros and Game 4 between the Cubs and Dodgers. The duo also look at Kenley Jansen's place in history, and more! Barstool Sports presents the Starting 9, featuring Jared Carrabis and Dallas Braden. The baseball podcast everyone wants but no one else will give you. Featuring guest Karl Ravech of Baseball Tonight, who joins to talk the postseason and John Farrell's exit from Boston. Jared and Dallas react to Yankees/Indians Game 5 and Cubs/Nationals Game 4 from Wednesday, and look ahead to the ALCS and Game 5 between Washington and Chicago. Barstool Sports presents the Starting 9, featuring Jared Carrabis and Dallas Braden. The baseball podcast everyone wants but no one else will give you. Includes two guests: Tim Kurkjian of ESPN and Sean Casey of MLB Network, both of whom give their perspectives on the postseason landscape. Dallas and Jared also reflect on the Yankees bullpen dominance in the AL Wild Card Game, and run through listener voicemails and tweets. Barstool Sports presents the Starting 9, featuring Jared Carrabis and Dallas Braden. The baseball podcast everyone wants but no one else will give you. Includes special guest Christian Yelich of the Marlins. The duo also runs through their end-of-season awards (MVP, Cy Young), they debate the idea that the Yankees should use an all-bullpen approach to the AL Wild Card Game, they dive into the likely Wild Card matchups...and listener voicemails! Barstool Sports presents the Starting 9, featuring Jared Carrabis and Dallas Braden. The baseball podcast everyone wants but no one else will give you. Includes special guest Ken Rosenthal, who talks changes in the industry and his job, Kluber-as-MVP-candidate, the Astros-as-World-Series-contenders, the NL MVP and the Angels bonus controversy. The duo also talks Cubs surge, Greinke/Neshek autograph nonsense and more. Barstool Sports presents the Starting 9, featuring Jared Carrabis and Dallas Braden. The baseball podcast everyone wants but no one else will give you. Includes TWO special guests: Mike Clevinger, the winning pitcher in the Indians record-setting 21st straight win; and Mark Mulder, formerly of the Athletics and part of the 2002 team that won 20 straight. In addition, duo talks Dodgers, the DH in the NL, the Cardinals, the NL MVP - and more! Barstool Sports presents the Starting 9, featuring Jared Carrabis and Dallas Braden. The baseball podcast everyone wants but no one else will give you. Includes special guest and record-setting rookie Rhys Hoskins of the Phillies; duo talks D-Backs winning, Dodgers losing, Indians as the best team in the AL, the ongoing Red Sox/Yankees cheating controversy, listener voicemails, Twitter questions and more! Barstool Sports presents the 5th episode of the Starting 9 featuring Jared Carrabis and Dallas Braden. The baseball podcast everyone wants but no one else will give you. Includes special guest Mark Melancon of the San Francisco Giants; duo talks Kershaw's return, the Mets injury devastation, the AL Wild Card, Mike Leake, Giancarlo Stanton and more! Barstool Sports presents the 4th episode of the Starting 9 featuring Jared Carrabis and Dallas Braden. The baseball podcast everyone wants but no one else will give you. Includes special guest David Ross, formerly of the Cubs and Red Sox; duo talks Trout vs Harper, fan code of conduct, AL Wild Card, listener voicemails and Twitter questions and so much more! Barstool Sports presents the 3rd episode of the Starting 9 featuring Jared Carrabis and Dallas Braden. The baseball podcast everyone wants but no one else will give you. Includes special guest Travis Shaw of the Milwaukee Brewers; duo talks Giancarlo Stanton's barrage, Dodgers, Rockies, Chris Sale-as-MVP, Aroldis Chapman and more. Barstool Sports presents the 2nd episode of the Starting 9 featuring Jared Carrabis and Dallas Braden. The baseball podcast everyone wants but no one else will give you. Includes special guest Aaron Boone; duo talks Trout, Goldschmidt, Judge, the AL Wild Card race, Barry Bonds and more. 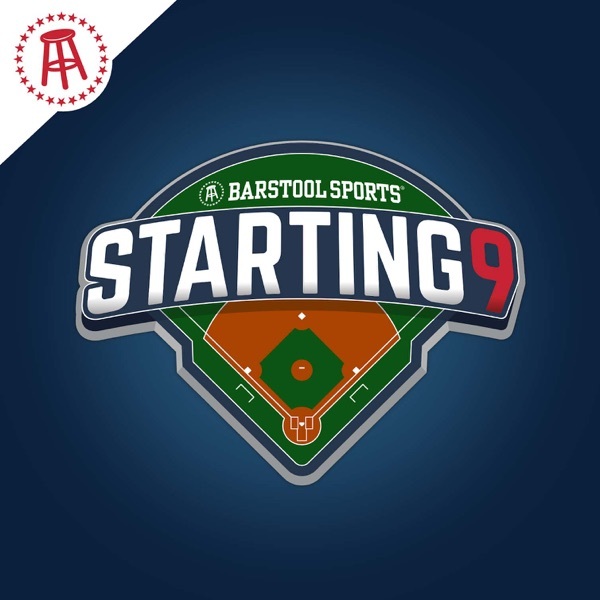 Barstool Sports presents the debut episode of the Starting 9 featuring Jared Carrabis and Dallas Braden. The baseball podcast everyone wants but no one else will give you. Includes special guest Brian Wilson; duo recaps the trade deadline, Jared's move to New York and more.